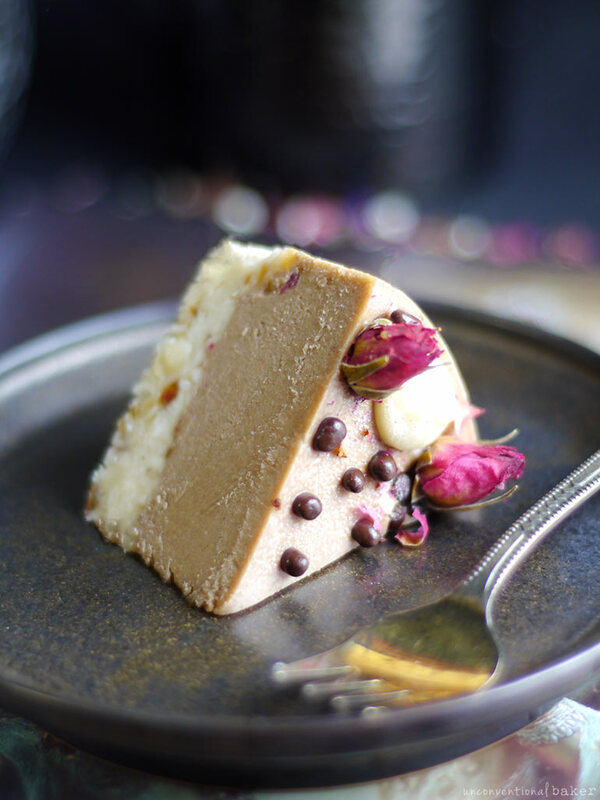 Bringing you another macadamia-based raw cheesecake, because it’s been a while since macadamia happened on the blog… but when it did it sure got around — a huge blog favorite and it’s a great alternative to the usual cashew-based cheesecake recipes. Not sure how you feel, but I’m super partial to the strawberry and lime pairing with macadamia (in fact strawberries and lime are just amazing, period. This cake or this pie, for instance, should convince you if you’re not already on board!). But I also get it… sometimes you’re just not in the mood for fruity. Anyways I love experimenting, so it felt like time to change things up — with some carob and mesquite in the mix. Result: uniquely delicious! Macadamia nuts — if you’re a lover — have an awesome but very potent flavor. If not paired correctly in a dessert, it kinda sticks out like a sore thumb… Macadamia nuts, however, pair really well with certain fruit (which have a great lightening-up effect), coconut, and warm spices like cinnamon. This is where I got the idea to try a cake out with mesquite and carob, and I loved it. It’s a very particular taste, but so good. If you’ve never worked with mesquite, or not in dessert, fear not — it’s just a spice, commonly used in spice mixes, but you can also buy it on its own (often in the “superfood” section as it also has some nice nutritional benefits). It’s made from a tree and has been used in certain cultures for centuries. It sort of tastes like something smokey, nutty, caramel-like, but none of those things in isolation, if that makes sense? People use it in things like steak rubs and so on, but I stick to cake, thank you very much ?. This is the brand I use btw. In Unconventional Treats there are recipes for pear mesquite and tangerine mesquite cheesecakes that I’m super fond of, which is what prompted me to make another variation as well. So if you get a bag of it and don’t know what to do with the rest, those are some alternatives to try out. Or you can always use it in smoothies or savory cooking — it’s really delish and adds a beautiful accent flavor. One more tip about it is that if you don’t want to buy a whole bag, you can sometimes find it in bulk in places that sell bulk spices, so you can just buy a few tbsp to experiment with, for pennies. Final note is that as usual this is a small 5″ cake, but if you don’t have a 5″ springform or just want to size the cake up or down, see the cake size conversion doc you can download at the bottom of this page to help you get the measurements right. 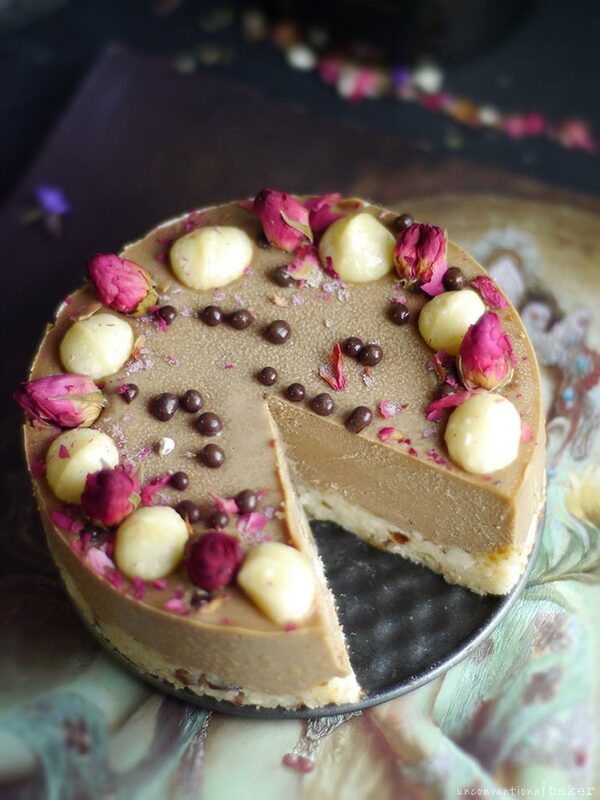 A uniquely delicious macadamia based cheesecake with spiced with mesquite and carob. 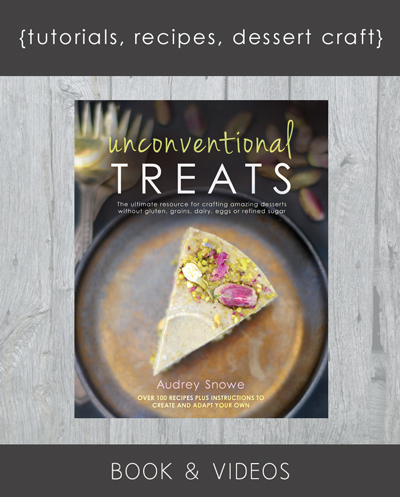 Dairy-free and refined sugar-free. Process all crust ingredients into a sticky crumble in a food processor. Transfer into a 5″ springform pan and press down into a flat crust. Freeze while working on the next step. Blend all filling ingredients into a smooth uniform consistency in a high power blender. Pour this mixture over the crust into the springform pan. 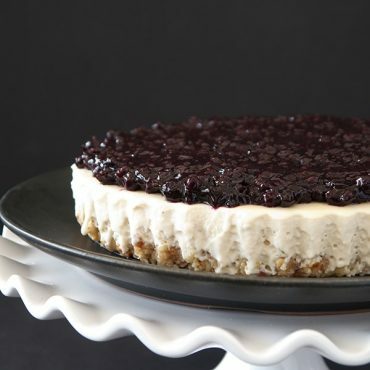 Decorate with desired toppings and freeze for 5-6 hours to set. Thaw out slightly, slice and enjoy! Keep leftovers frozen. 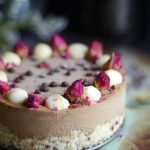 This post contains affiliate links to the springform pan, mesquite, and rose buds used in this cake. Hi – I’m not sure when you posted this, or if you’re still reading these comments…. I just made the recipe, and am waiting for it to set in the freezer. I’m wondering if maybe the amount of Macadamia nuts in the filling should be more? 1/2 cup soaked made hardly any filling, and it was insanely sweet. I added in more (unsoaked) macadamia nuts and then increased the other ingredients just going by taste and texture, adding a little water ’cause it was too thick (yes, if I was patient and soaked the additional nuts I probably wouldn’t have had that problem!). It looks like it will come out nicely. 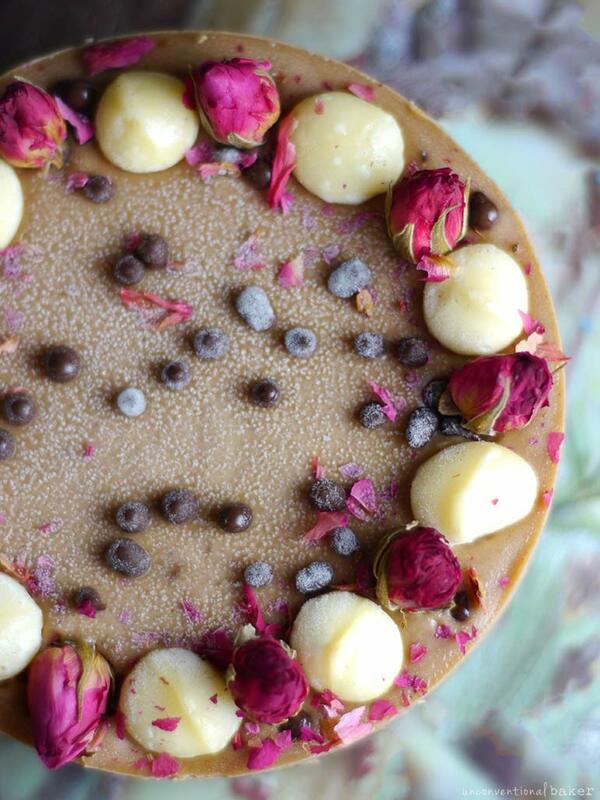 But really, how did 1/2 cup macadamia nuts produce such a tall cake in your photos?? Thanks! and thanks for all the yummy recipes!! The above are total guesses as I don’t have any context. A 5″ pan doesn’t hold more than about 1 1/2-2 cups contents (depending on how tall your rim is), so if you think about the crust taking up some of the space, the macadamia expanding to about 3/4 cup once soaked + 13 tbsp of extra contents, one blended down should come up to about the right amount. Of course if you have room and wanted to make it super tall you could add more contents, though as you experienced adding in unsoaked nuts would spoil the texture. 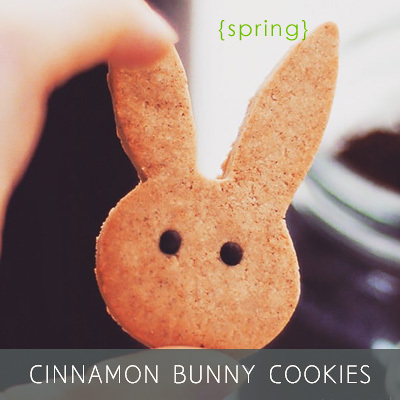 Sweetness can always be adjusted to taste as well. 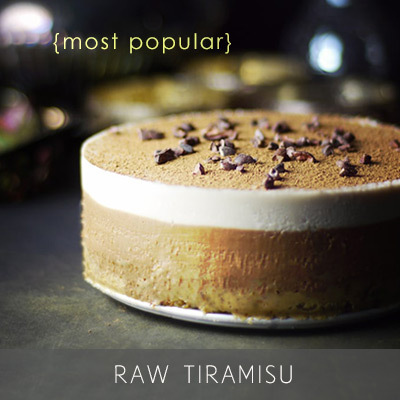 The best thing about raw cakes is that you can taste the batter as you go along and judge the flavors and make adjustments as needed. P.S. What size are your measuring spoons? 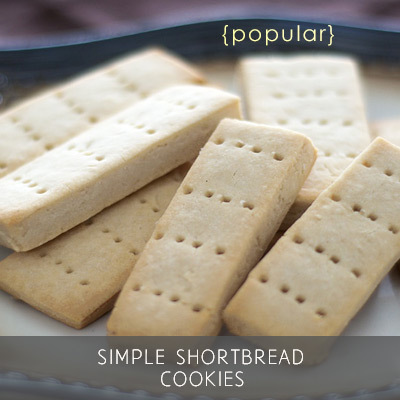 In some countries (like Australia, 1 tbsp = 2 tbsp — I wonder if something like that could have made the cake too sweet?). Either way, I’m sorry it didn’t work out this time around. It’s hard to judge from not being there and offer advice without knowing more. I’d love to figure it out though — so if you get a chance, let me know your thoughts about any of the above possibilities. Is there cream cheese in this recipe? I don’t see it listed in the filling ingredients. this looks so delicious! 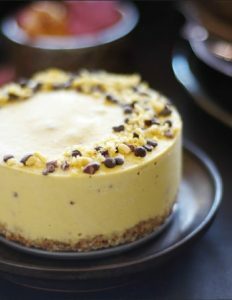 No, no cream cheese — it’s a raw cheesecake, which is a type of dessert made from nuts instead of dairy (I don’t use dairy in any of my recipes). I’m so happy I found your site thank you! MD thinks I may have an allergy to dairy and gluten, so she wants me to do an elimination diet. Looking forward to your recipes ? At first I was a little thrown off by “…sometimes you’re just not in the mood for fruity” part (really!?!? lol) But even I sometimes just want something deep and decadent and caramel rich like this! I’ve never had mesquite, but the flavor profile of this cake is very much intriguing me. The spice, the tang, the smokey-ness, the nuttiness–so much going on. 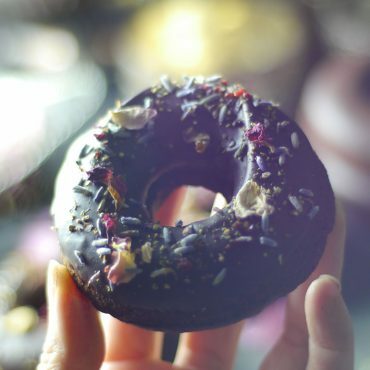 And I love the decor, one day I will find those little choco-covered quinoa puffs that look so cute and good :) After hanging around you long enough I really do think there are infinite cake possibilities out there! Ok, I think I just have to ship some to you already! I feel like we’ve been talking about them for years ?. I just looked them up and they are currently sold out (of course…! I think often chocolate products don’t ship until the weather cools off… ). When I spot them again, expect a shipment :D Email me your address when you get a chance. 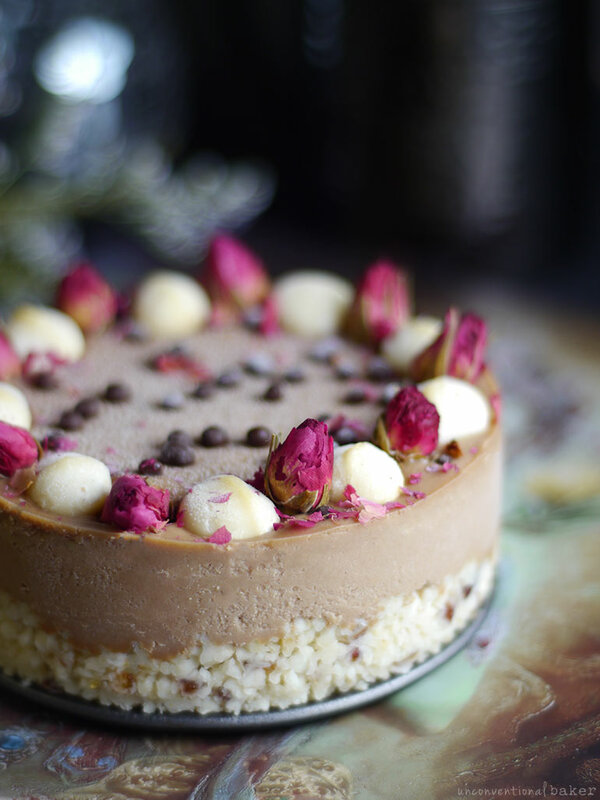 I’ve never made raw cheesecake with macadamias! Thanks for the inspiration, especially as this features carob, which I adore. You’re welcome, Kari :) It’s a nice change up from the typical cashew.